Yes! You can work with your child at home in the NeuroSuit™ following a specifically designed home program of intense exercises at home. If you can commit to a few hours per week to work with your child or loved one at home, then we can teach you how to apply the NeuroSuit™ in the comfort of your home. 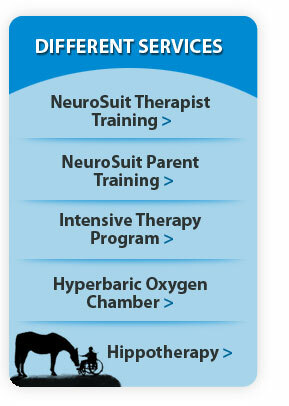 Many families chose to bring their child to our intensive therapy program first to learn how to use the NeuroSuit™ over the course of the 3 week program. Training is free for those who chose this method. Others chose to attend our 2 day training program for parents where you learn first-hand how to put on the NeuroSuit™ and which specific exercises to perform on the first day. The second day, we will review application and the parent must demonstrate competency to apply the NeuroSuit™ and demonstrate an understanding of the home program exercises developed particularly based on your child’s needs. After you receive training, receive ongoing support and guidance via video chat, telephone, email or courses to update the your child’s home program as they grow and make progress.